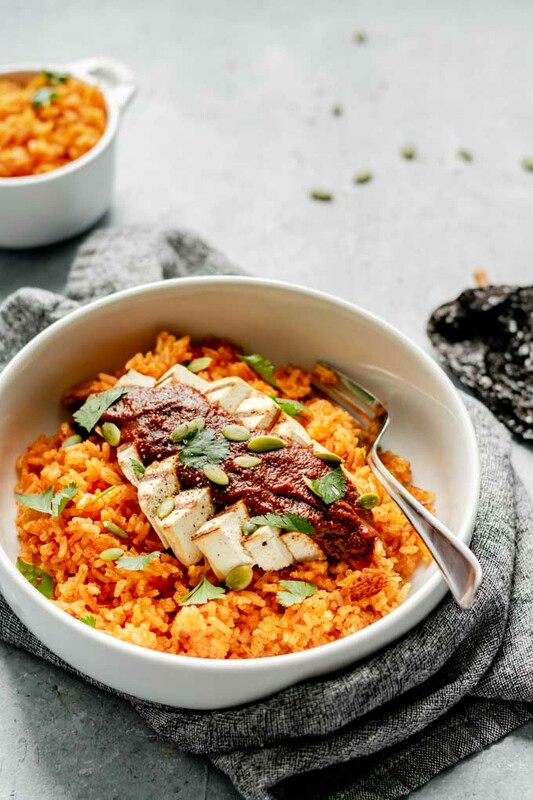 Outside of Mexico, when you think of mole sauce you probably think of that darkly colored, richly flavored, nuanced chocolate-chili sauce called mole poblano. A recipe that will have you laboring over the stove for hours with an equally long ingredient list. But mole (pronounced moe-LAY for those unfamiliar with the dish) comes from the Nahuatl word for sauce and refers to a wide range of traditional sauces in Mexican cuisine. For most mole sauces the base is made of dried chiles, fruit (often dried), nuts, and spices. This pumpkin mole follows the same basic formula, with ancho chiles for the dried chiles, pumpkin for the fruit, pepitas for nuts, and plenty of spices. I use a few short cuts–like canned pumpkin instead of roasting my own, ground spices instead of toasting whole and grinding them myself–but the results are still absolutely mouthwatering. The idea to make a pumpkin mole has been simmering in the back of my head for the past year after I encountered a bottled version at the grocery store. I didn’t try it at the time, but the thought of making my own has been with me since and boy was it worth the wait! But also, not worth waiting, so make this now and not a year from now! I promise you won’t regret it 😉 . Pumpkin mole is a rich and deeply flavored sauce, with balanced sweet, savory, smokey, and spicy flavors. The sweetness of roasted pumpkin puree is enhanced with cinnamon, nutmeg, and allspice while balanced with cayenne for heat and cumin for its savory notes. 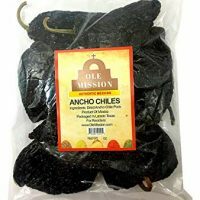 Ancho chiles (which are dried ripened poblano peppers) are a mildly spicy chile with used for their smokey flavor and raisin-like sweetness. Onion and garlic are fragrant aromatics and bring a sweetness and sharpness to the pumpkin mole sauce. I add tomato sauce for acidity, it brightens the flavors and adds a bit of tang. To thin the sauce out I use vegetable broth, which brings layers of flavor without extra work (assuming you use store bought broth or bouillon). Instead of nuts I use pepitas, which are a specific kind of pumpkin seed that doesn’t have a hull (the white shell). Pepitas have a mild nutty flavor and blend to thicken the sauce while adding slight bitter notes. Lastly I add some brown sugar and salt to the pumpkin mole. Sugar enhances the savoriness of the sauce and adds caramelly notes. To start the sauce, toast the ancho chiles and pepitas on a dry pan. This brings out the flavors of those ingredients, turning the pepitas toasty and the anchos fragrant. Toasting the chiles makes it more soft and pliable, so it’s easy to remove the stems and seeds from inside the pepper before soaking in boiling hot water to rehydrate. Make sure to wash your hands immediately after or wear gloves when handling the peppers, anchos aren’t particularly spicy but you still don’t want to rub your face after handling them! Next, sauté the onion and garlic until browned and softened. It’s ok to bring a little char to the onions here as it adds to the smokey qualities of the final sauce. Cooking the whole smashed garlic cloves mellows them so that they don’t overpower the mole. Then we add everything to the blender! The toasted pepitas, the anchos (hydrated and drained), the sautéed onion and garlic, the canned pumpkin, tomato sauce and broth, spices, salt and sugar (start with the smaller amounts). Blend them all together until smooth, then return to the pot and bring to a simmer. Leave the lid ajar (you can prop it open with a wooden spoon) so steam escapes, but make sure to use a lid otherwise you’ll end up with a splattery mess all over your stove. The pumpkin mole is simmered for a long time to layer the flavors and bring them together harmoniously. You’ll want to cook it for a full half hour, tasting towards the end and adding more salt and sugar as desired. The sauce will taste even better the next day, so feel encouraged to make it in advance. The recipe makes a huge amount, so get creative in how you use it! It’s great over grilled tofu, but you’ll be able to stretch it over several pounds. You can also douse roasted vegetables with the sauce. Or even cook the vegetables in the sauce (more broth will probably be necessary in this case). The pumpkin mole is also great cooked with beans, seitan, or tempeh. You can make the best tacos with this recipe! We enjoyed leftover grilled tofu, sliced up and tossed in the pumpkin mole, stuffed in corn tortillas and topped with extra pepitas for crunch. Leftover sauce is going to find its way over pan fried seitan before meeting the same tortilla wrapped fate. The sauce will freeze very well, so know that’s always an option! 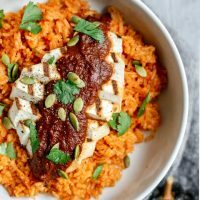 I didn’t plan on sharing a rice recipe alongside the sauce, but knew I wanted to serve the pumpkin mole with grilled tofu and have a side of Mexican rice and black beans. I guess I figured you’d want to do the same! Making this style of rice requires a few extra steps. Fry the rice lightly in oil along with garlic, cumin, and salt, then cook it in broth and tomato sauce. Once all the liquid is absorbed, let it sit and steam for 10 minutes, then fluff with a fork. Just like making regular plain rice but with a lot of extra flavor! Maybe I’ll share the quick black beans (not pictured) we enjoyed with this recipe another time, but these Mexican pinto beans would also be fantastic with the mole! 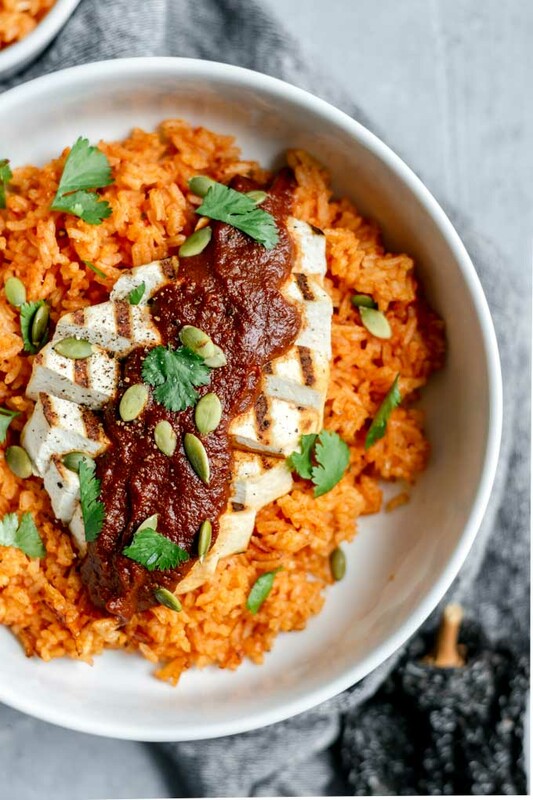 If you make this mouth watering pumpkin mole with grilled tofu and Mexican tomato rice, leave a comment and give the recipe a rating on the recipe card below! Also don’t forget to share your creations with me on Instagram, tag @thecuriouschickpea and #thecuriouschickpea, I absolutely love seeing your photos! 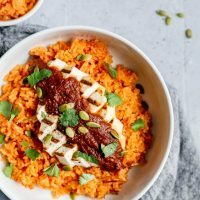 This richly flavored pumpkin mole is perfect for topping grilled tofu, seitan, or sautéed vegetables. 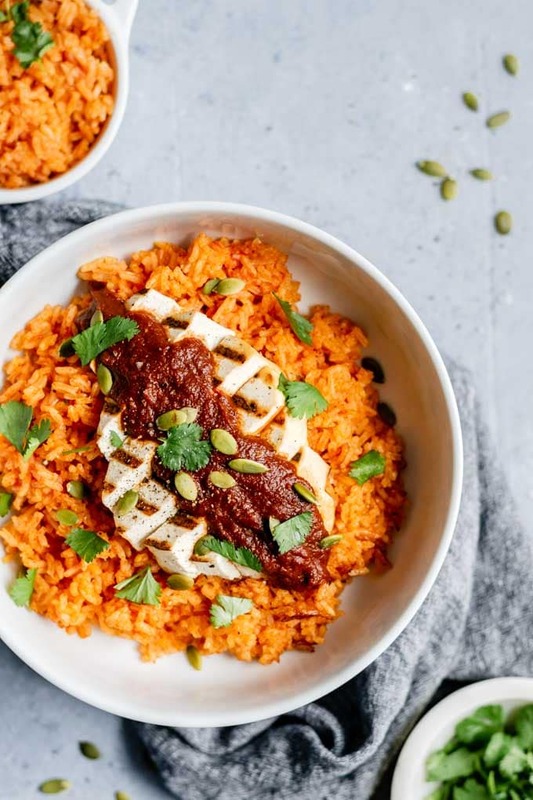 It's an easy sauce made with dried chiles, cooked pumpkin, tomato, and spices, and elevates any protein or vegetable you top it with. In a dry pot toast the ancho chiles and pepitas over medium heat until they are fragrant, the chiles are pliable and the pepitas are starting to brown, 3-5 minutes. Remove from heat. Remove the stems and seeds from the ancho chiles and cover with boiling hot water and leave to soften as it cools. In the same pot heat the oil over medium and sauté the onion until it starts to brown, about 5 minutes. Add the garlic and cook until it's fragrant and turning golden, about 2 minutes. Transfer the onion and garlic to a blender along with the pepitas, canned pumpkin, tomato sauce, vegetable broth, soices, 1/2 tsp of salt, and 1 tbsp of sugar. Drain the ancho chiles and add those as well. Blend until you have a smooth sauce, then transfer back to the pot. Cover the pot, leaving it ajar, and bring the sauce to a simmer. Cook on low for about 30 minutes to bring all the flavors together. Taste the sauce and add more salt to taste, and add more sugar to balance the spices if needed. The sauce can be made a day or two in advance and reheats really well. To grill tofu: heat a grill pan over medium high heat. Brush one side of the sliced tofu with oil. Put the oil side down on the grill and leave until the tofu starts to char, about 3-4 minutes. Brush the top of the tofu with oil and sprinkle with salt and ground pepper then flip and grill the other side. Add salt and pepper to the second side. 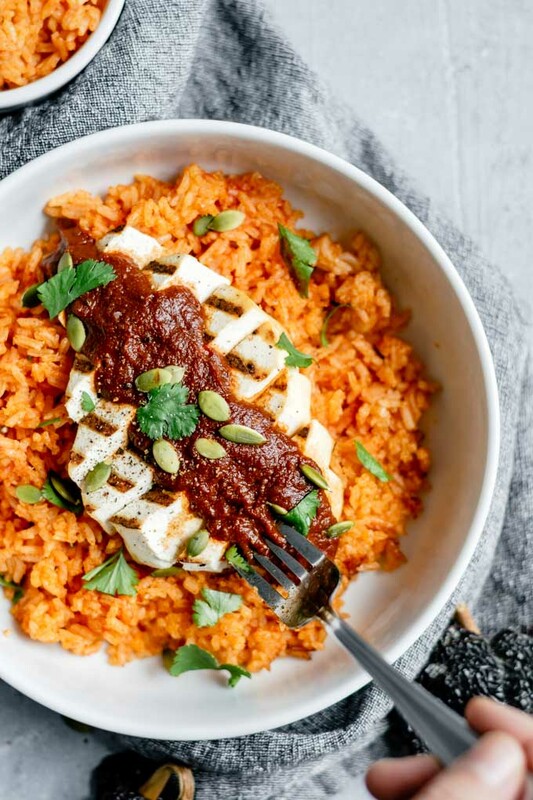 Cut the grilled tofu on a bias and serve with the pumpkin mole and Mexican tomato rice and Mexican pinto beans. 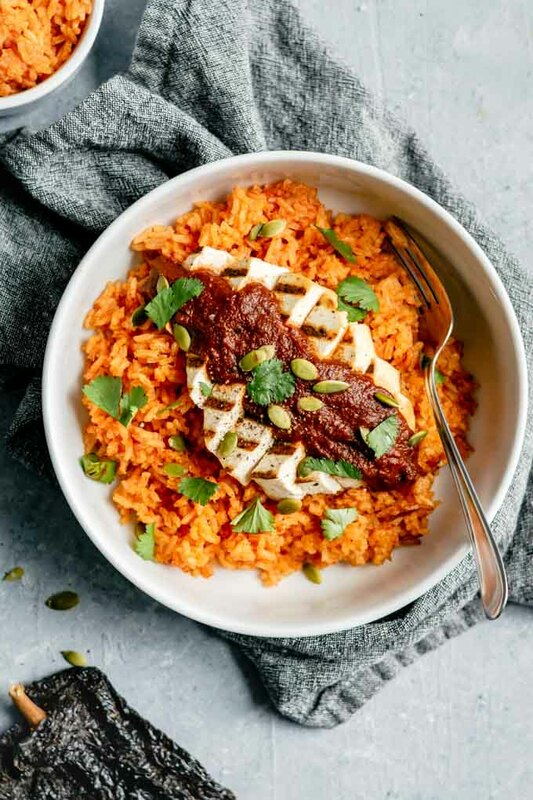 This Mexican tomato rice is a flavorful way to prepare rice, and makes a great accompaniment to any Mexican or Tex-Mex meal. Heat oil in a medium sized pot and add the rice. Sauté the rice until it's turns a shade darker and starts to stick to the bottom of the pot. Add the garlic, cumin, salt and cook another 1-2 minutes. Add the broth and tomato sauce and bring to a low boil, turn the heat down to low and cover the pot. Cook for 20 minutes, or until the liquid is absorbed. Turn off the heat and leaving the lid on allow the rice to steam for 10 minutes. Then, fluff with a fork and top with minced cilantro to serve. YUM I can’t wait to try this pumpkin mole sauce, I’d never heard of it before! 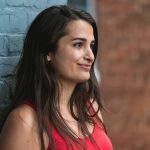 Thank you for sharing your delicious recipes.